My name is Jeff Klein. Having long been a fan of Coach K and Duke Basketball, I am honored to play a small role in the organization by designing and maintaining this site. I am a Coach K fan for many reasons but the following anecdote stands out in my mind as a perfect example of what a Coach can be. In 1989, Duke was playing a close game against Arizona. With one second left, and Duke down by two points, freshman Christian Laettner was fouled and sent to the free throw line to shoot one-and-one. Laettner missed his first shot and Duke lost the game. But what happened next was remarkable. 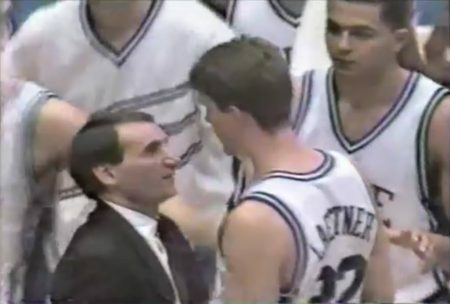 In addition to Laettner’s teammates consoling him, I recall Coach K going right over to Laettner to offer his advice and encouragement, even before shaking hands with Arizona Coach Lute Olson. Was Coach K upset about the loss? I am sure he was disappointed, but he saw an opportunity to impart to his players something more than just how to play basketball. In that moment, Coach K revealed his true character. He showed he cared more about the player than he did about the outcome of the game. He showed himself to be a leader…a teacher…a Coach in the best, truest sense of the word. As it turned out, Laettner was a good student. Two years later, in 1991, Laettner found himself in a similar situation with the game on the line. This time the score was tied against UNLV in the Final Four, and Laettner went to the free throw line with 12.7 seconds left in the game. Drawing on his earlier experience, Laettner confidently sank both free throws to win the game. Duke went on to beat Kansas in the finals for the school’s first national championship. As for me, I fell in love with the game of basketball in high school. During my freshman year at Indian Hills (Oakland, NJ), I could barely make a lay-up. I became a student of the game and played as much as I possibly could. By my senior year, I was the team captain and leading scorer. I went on to play college basketball at Goucher College (Towson, MD). 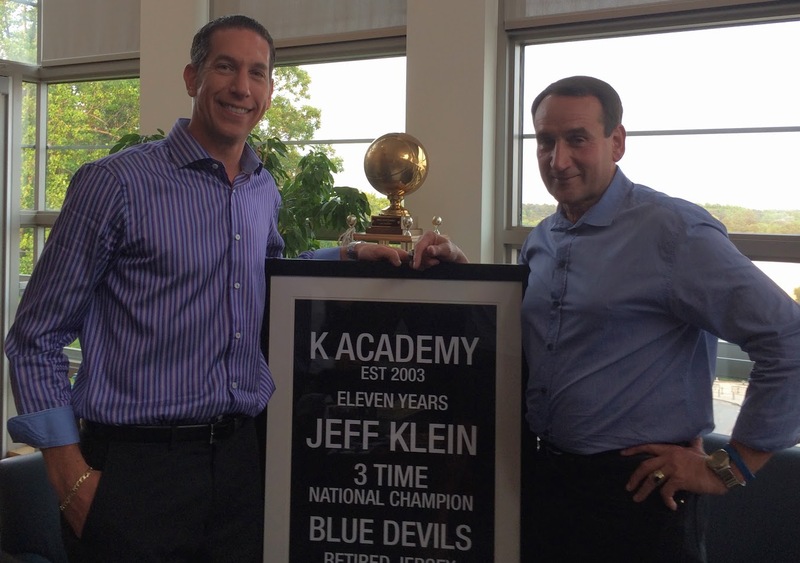 In August of 2004 I had the honor of meeting Coach K while attending the K Academy. You can read about my experiences at the camp in my K Academy Journal. In 1998 I founded Power Play Marketing, a Delray Beach internet marketing company offering web design, search engine marketing, and reputation marketing services. In 2015 I became the Senior Director of Internet Marketing for FineAwards.com. We are a crystal award design and production powerhouse – dedicated to ‘wowing’ our clients with custom glass trophies, awards, and plaques. Based in Hollywood, FL, our team has over 40 years of experience designing and manufacturing gifts and awards for Fortune 500 companies, sports franchises and charities around the world. Clients include: Google, NFL, ESPN, Starbucks, NBC, FedEx and many more. 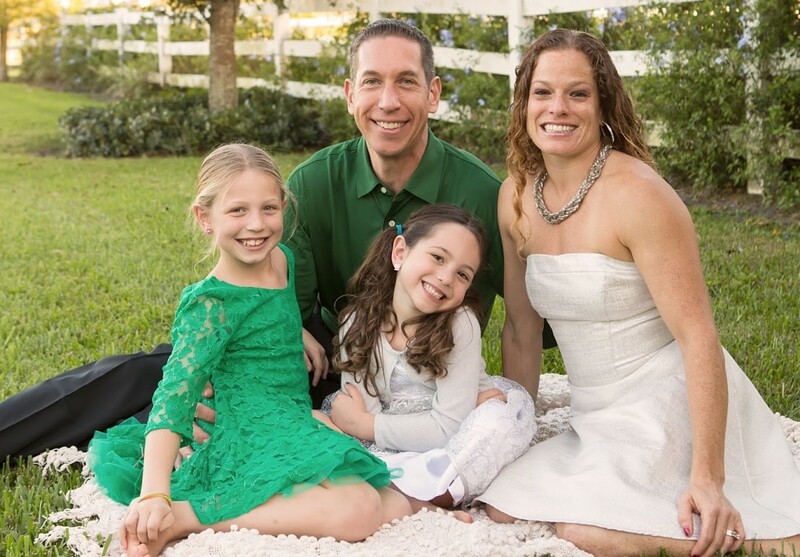 I currently live in Delray Beach, Florida with my wife Tricia, our daughters Taylor and Addison, and our dog Maggie. I still love the game of basketball and play regularly. If you have any comments about this website, please send me an e-mail. Please note, this is not a way to contact Coach K.
If you’d like to learn more about me, you can also visit my blog at JeffKlein.com. Autograph request and other correspondence for Coach K should be sent to Coach K’s Assistant, Gerry Brown.